Last weekend was the big Travel Bloggers Exchange in Toronto - TBEX. I was one of the over 1200 travel bloggers who joined in for keynotes, seminars and sponsor/PR meetings. My impression was that most of those who were in attendance are professional travel content creators. They make their living by writing and photographing for their own blogs, for travel media or as freelancers. The conference provided plenty of professional development opportunities, including commerce and business seminars and a marketplace for interacting with potential sponsorship partners. I am a hobby blogger. Yes, I've been at it almost ten years, I've had a few pieces published and I've made a little cash off my travel photography. But I am not a pro-blogger. I have no plans to pursue this as my career right now. So, I avoided everything that was business-oriented. I also skipped the keynotes but that's because I hate keynotes. 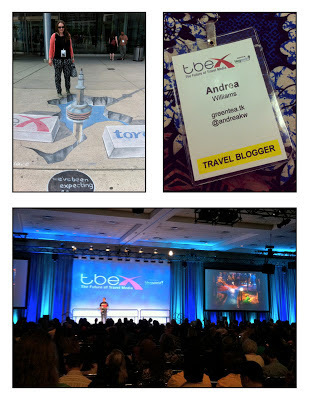 So, was there anything for me to learn from TBEX as a hobbyist? Absolutely. I attended four content seminars and I picked up practical and specific advice on how to improve my blog. I am now inspired to create more useful and higher quality content for greentea.tk. To be honest, I'd like to go back over my archives, delete 93% of my old posts and re-write the rest! • You are better off publishing two well written, well researched posts per month than publishing a high volume of low quality posts. • Your audience is unlikely to be interested in a journal-like narrative of your latest holiday. Readers do want inspiring stories or advice they can use. Readers will get bored of you long before they are bored of your destination. Use your blog to help or inspire others to travel rather than to show off your experiences. • I kind of expected that with 1200+ bloggers in attendance, most people at TBEX would not already know each other and that it would be easy to meet new friends and peers. I thought I would not need to navigate a lot of pre-formed cliques. In actual fact, it seems most of the attendees were long lost best buddies who were not especially motivated to socialize with newer faces. Similarly, I thought that a convention largely made up of freelance writers would have included a lot of introverts, but I was wrong again. I got through five parties and two days of sessions by making a big effort to talk to anyone who seemed open to being spoken with, but there were far fewer of us lone wolves around than I expected. • Something interesting for me was to see Toronto reflected in the gaze of all these well-travelled visitors. Tourism Toronto was one of the main sponsors of the conference, splashing out on the Toronto-themed opening night party and also running special tours and experiences for the visiting writers. From the TBEX crowd, I overheard and read a lot of rave reviews of Toronto. I work right downtown in Toronto and I've lived in the centre of the city for over 12 years in total: I know this place. However, I was having trouble recognizing my own city in this promotional campaign. Tourism Toronto did what all good destination marketers do - they made this city seem like an unparalleled cultural and culinary playground. I don't know, maybe I've spent too much time here. Maybe this really is the greatest place on earth but I just haven't noticed it? -figure out why you are the authority on a topic. is it your passion? -go broad or go deep! Lola's presentation is available online here. I recommend viewing it for her tips and her photos, too! -don't hide the negative. misery is hilarious! -write less. there is quality and higher desirability in limited content. -is it useful? does anyone care? -does it answer a real question? -did you proofread, check your facts? -check the perspective/point of view. is there some other way to write this story? -cut what is not in service to the piece. fewer words are better. You attended completely different sessions than I did. Thanks for posting your notes! Thank so much for this post and your notes, I have printed them for future reference. I too live in Toronto and currently blog for a hobby AND am an introvert so I could relate to much of what you experienced. THIS: " I got through five parties and two days of sessions by making a big effort to talk to anyone who seemed open to being spoken with, but there were far fewer of us lone wolves around than I expected." YES! I was to especially 'YES' your use of the term 'got through'; the social events almost killed me! And I'm a SUPER extrovert! It seemed EVERYONE knew each other. And I was all alone. I truly believe there were more of us than it seemed, we just didn't know each other. Thanks for your notes! :) I actually had a very similar experience at a travel blogger conference (not TBEX). I try not to let the cliques or superficial people get me down, because they're always going to be there, in every profession. I left knowing more about who I do or don't want to work with/for in the future, and that was the best information I could walk away with. It's something you can only really figure out when you meet in person, so I don't regret attending at all.